This 3-4' Hicks Yew hedge unit is ready to be planted in its biodegradable cardboard container. A 4-5' yew (Taxus) InstantHedge in biodegradable cardboard container ready to be planted in the landscape. This 5-6' yew (Taxus) hedge has been dug and placed in our biodegradable cardboard container. These yew (Taxus) InstantHedge units are conveniently transported via a pallet and ready to be planted in the landscape. 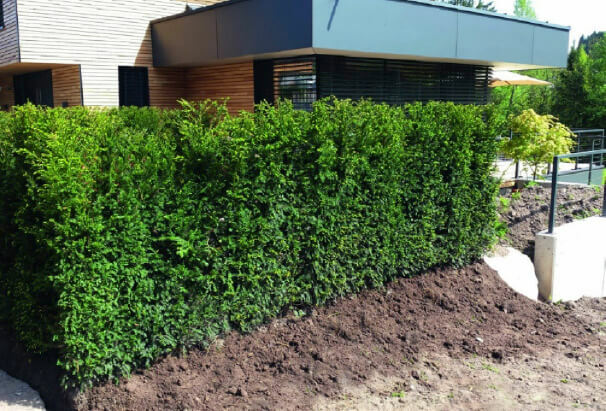 The recently-installed yew (Taxus) hedge shows substantial privacy in just one day! With equipment such as this, planting even long distances of hedge can be very easy. These Hicks Yew hedges are nearly ready to be harvested at 3 feet tall. Colorful reddish fruits called arils develop on Hicksii yew (Taxus media 'Hicksii') to look like little ornaments on the branches! A finished 3-4' hedge of yew (Taxus). This yew (Taxus) hedge has been grown to 5' high. A large order of yew (Taxus) as well as European beech (Fagus sylvatica) is prepared by the loading dock ready for shipment. Young, strongly-rooted plants are chosen for planting in the field to create vigorous, consistent InstantHedges. Even in winter, the foliage holds a rich dark green color on yew (Taxus). This truck has been loaded with shorter yew (Taxus) hedges and taller European beech (Fagus sylvatica) hedges. The shrub is popular in the northern regions of the United States, as it grows well in cool and shady climates. The yew is evergreen, maintaining a deep olive color throughout the year in many different climates. With a slow growth rate of less than 1 foot per year, the yew is an easy hedge to maintain for long periods of time. As it’s resilient to salt and pollution, Hicksii is a fantastic choice for yards in coastal or urban areas. With long upright branches, the yew has a distinctive column-shaped habit that creates a uniquely attractive hedge row. Taxus X Media Hicksii hedge prefers moist sandy loams, but it does not grow well in overly wet environments. In England, the semi-toxic yew was once relegated to growing only churchyards, where cows were unable to graze on the shrub. Interestingly, and perhaps unfortunately for gardeners today, deer are both attracted to the yew and can eat its leaves without harm. Pest/Disease Issues: No serious problems. Weevils, mealybugs and scale are problems in some areas, as are twig blight and needle blight. Dense, evergreen, easily-maintained Hicks Yew hedges are the perfect choice for low, artistic borders. This elegant yew (Taxus) hedge not only provides an effective screen but also creates an elegant backdrop for an outdoor living area. With their dark green color and feathery texture, Hicks Yew hedges make excellent low borders that complement other plants and stone. Hedges can be used in combination with gates to make a private area in a favorite part of the garden. The flowers on this patio have even more stunning color when set against the dark green background of a yew (Taxus) hedge. Hicks Yew (Taxus x media ‘Hicksii’) is a plant that was truly bred for hedging in the United States. With lush evergreen foliage, a form and growth rate perfect for hedging, extreme cold-hardiness, excellence in both full sun and full shade, and low maintenance needs, it is one of the most popular hedging choices on the market. Bred in New York by Hicks Nurseries, Hicks Yew is a cross between English Yew (Taxus baccata) and Japanese Yew (Taxus cuspidata). The result of this cross is a gorgeous yew tree with lovely physical features of the English Yew and the cold-hardiness of the Japanese Yew. Hicks Yew is an evergreen with fresh, bright green growth in spring and fern-like, dark foliage for the rest of the year. It is lush and dense, with the classic yew look that has been favored by gardeners for reportedly thousands of years. It also bears attractive bright red fruits, called arils. These are toxic to mammals but are loved by birds. This vigorous hybrid grows in a tall, upright form. It has a moderate growth rate that is easy to control but also reaches a good size without having to wait very long. It can reach up to about 18 feet tall at maturity, but is often kept as an 8-12 foot hedge. It can spread up to 10 feet wide at maturity, but it is easy to keep as a narrow hedge as well. It is multi-stemmed and primarily grows straight up. It responds very well to pruning and can easily be maintained at any desired size and shape for many years. One of the top benefits of the Hicks Yew is its cold-hardiness from the Japanese Yew parentage. 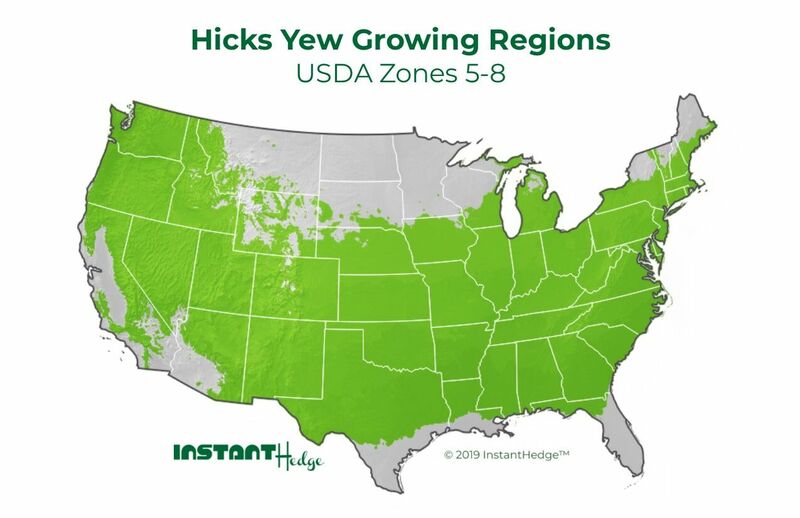 It is hardy to USDA Zone 4a and can be easily grown up through Zones 7 or 8. This wide range makes it a great choice for most of the United States. Another great thing about the Hicks Yew is its tolerance of all sun exposures, from full sun to full shade. Most other evergreen hedges prefer full sun, and some can tolerate partial shade, but none do as well in deep shade as the Hicks Yew. This flexibility is incredibly useful when designing as exposure doesn’t need to be considered. While Hicks Yew is a relatively new variety, Taxus baccata (one of its parents) is known to be an extremely long-lived plant. There are many examples of English Yew hedges in Europe that are hundreds of years old, and the oldest living yew tree is supposedly between 1,500-3,000 years old. Hicks Yew specifically has been known to easily live past 50 years under good growing conditions. Hicks Yew is a very low-maintenance plant, which is of course an ideal feature for a hedge plant. The only thing it does not tolerate well is wet soil – everything else it can handle. Easy to plant, easy to irrigate, easy to fertilize, easy to prune…you won’t spend much time maintaining this hedge. Hicks Yew thrives in full sun, part shade, and full shade. It is highly tolerant of urban conditions. It is not picky about soil types and can grow well in poor soils. The only thing you will need to consider is soil drainage at the planting site. Yews of any kind will not thrive in soggy soil. Amending the soil with organic matter, installing drain systems like tiling or directing water flow toward stormwater drains, and raising the planting site are all good ways to improve drainage. You can plant a Hicks Yew hedge at any time of year, but the ideal times are fall, winter, and spring. You might try to avoid planting when it is very hot, especially if there is a lot of fresh new growth on the plants. If you do plant at that time, make sure to keep the hedge well-watered. Amending the soil with some organic matter before planting will help provide nutrients and improve soil drainage. Applying a generous layer of mulch over the roots will help protect them as they grow and establish. Yearly mulching will also help with drainage and nutrients. Yew hedges can be planted any time of year. If planting in summer, make sure to provide ample water. Once established, yew plants are drought-tolerant. For the first 2-3 years after planting, be sure to add about 1 inch of supplemental water per week in hot, dry periods. Do not overwater – yews do not like wet feet. Taxus do not have high nutritional needs, but application of a slow-release fertilizer at a low rate will help encourage faster growth. Another wonderful thing about using yew as a hedge is that they are highly adaptable to pruning. The best times to prune are early spring or late fall, and it is only needed once per year. A big difference between yews and other conifer hedges like arborvitae is that if you accidentally let a yew hedge get too big and need to prune hard to get its size under control, it will fill back in and do just fine. 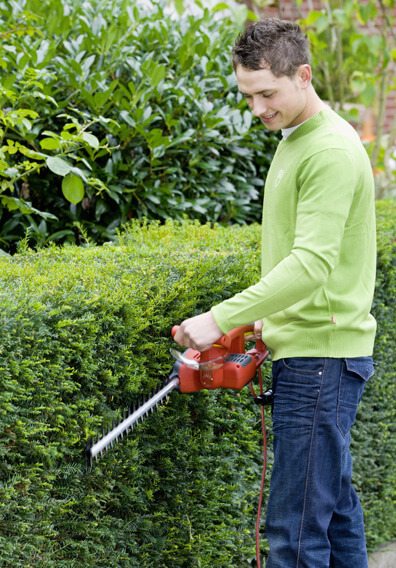 Yew can be pruned either with hand shears or an electric hedge trimmer, as long as the blades are sharp. Yew does not have any major pest problems. Deer typically avoid it but may browse especially in winter when other food sources are scarce. Spring and fall are the best times to prune yew hedges. 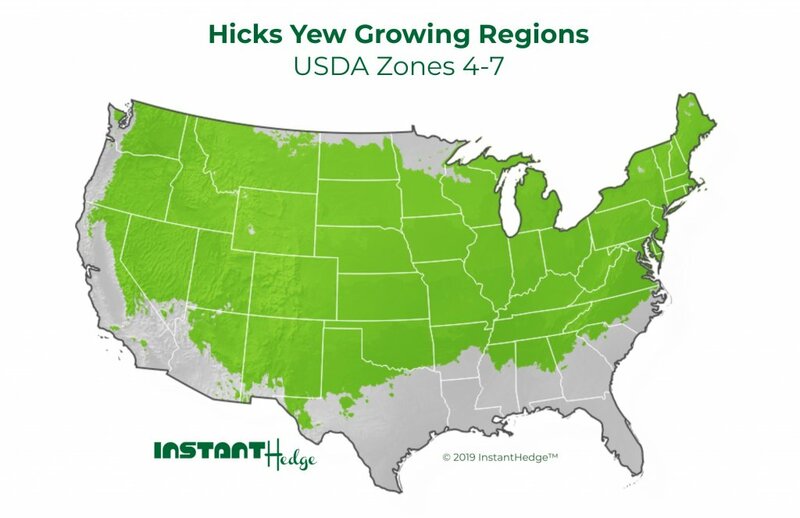 Why Choose Hicks Yew InstantHedge? Hicks Yew grows at a slow to moderate pace, so planting a traditional hedge will mean waiting years for a full, finished privacy screen. Finding large plants to begin with can be expensive and difficult, and starting with small plants will mean waiting a very long time and potentially losing individual plants to the stress of being planted too small. There is also the trouble of digging many holes and making sure all the plants are straight upright. Planting a traditional yew hedge is labor-intensive and complicated (left). Planting a yew InstantHedge is fast and simple (right). Planting a Hicks Yew InstantHedge means the work of waiting has already been done for you. Simply plant the yew hedge units end-to-end in a trench. 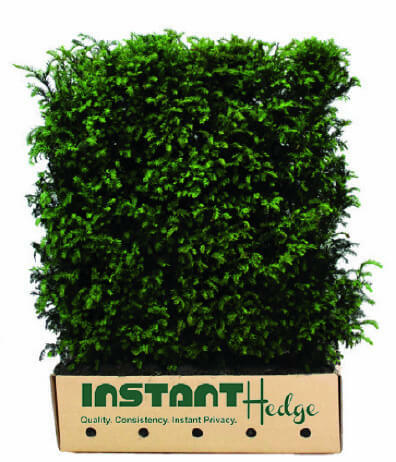 They are pre-spaced, pre-shaped, and pre-finished so that you can have a mature, finished hedge in just one day. A garden nook such as this feels much more cozy with living hedges of yew (Taxus) in the foreground and beech (Fagus) in the background rather than cold, impersonal fences. Multiple types of hedges are used in this backyard garden to create layers and thus make the landscape seem larger. Separate areas of the garden can be separated into rooms with a living "wall" like this yew (Taxus) hedge. This outdoor space is framed thoughtfully with well-maintained yew (Taxus) and laurel (Prunus) hedges. This elegant yew (Taxus) hedge not only provides a more effective screen than a traditional fence but also creates an elegant backdrop for an outdoor living area. Yew (Taxus) hedges form an allée around this stunning water feature in a modern country landscape. Where homes are fairly close to each other, a well-placed hedge like this yew (Taxus) can make your outdoor space more inviting. Stunning, colorful plants look best when set against a verdent background like the leafy, dark green hedge shown here. This yew (Taxus) hedge has been pruned to form a privacy wall in this outdoor seating area. A yew (Taxus) hedge forms a beautiful border between two residential areas. Evergreen hedges like this yew (Taxus) can be used to soften metal and stone elements in a landscape. The feathery, soft foliage of Hicks Yew softens the concrete and sharp angles on this modern patio. The soft evergreen foliage of this shade-tolerant yew (Taxus) hedge makes it the perfect partition for this suburban garden. This beautiful garden and flowerbed seem even more inviting with the yew (Taxus) hedge providing a background of privacy. This small koi pond is enveloped with a mature yew (Taxus) hedge that has been kept to 6' high. Here two different types of hedge are used, both a taller evergreen yew (Taxus) hedge and European beech (Fagus sylvatica) hedge. In winter, the yew (Taxus) hedges in this European landscape are so elegant with a dusting of snow. Hicks Yew makes a low-maintenance, dense hedge, perfect for creating maze gardens to delight the public. Even after many years, a well-maintained yew (Taxus) hedge like the one pictured here at a European estate forms a dense hedge to the desired height. This outdoor space is framed thoughtfully with well-maintained yew (Taxus) hedges. After years of diligent pruning, yew (Taxus) hedges can form a veritable wall to enclose a courtyard such as this. A park or public garden can be made more elegant with tall, wall-like hedges like the yew (Taxus) shown here. This Hicks Yew border creates a peaceful space in a public garden seating area.